Update Activation For Displayed Reservations: There is a new function in Manage Reservations and Edit/View Reservations called Update Activation For Displayed Reservations that updates all displayed reservations. Improved Reservation tabs: In the Check In/Out window, there are 2 new functions (Delete and Print) on the Reservation-Item and Reservation-Borrower tabs. Improved Reservation Warning: Reserved item is automatically selected when the item is checked out by a borrower who reserved it. Improved RESERVEDON, RESERVEDUNTIL, AVAILABLEFROM dates management. Improved Equipment Circulation Window sounds: New sound is added (process.wav). The sound is generated after the check out/in transaction is processed. Moving loan transaction to Old loans is improved. Errors fixed: Search/Show queries in the Manage Reservation are fixed. Track new item types: track unique, inventory, and consumable item types. Custom Views Improved: Improved interface, improved management of custom view templates. Statistics Improved: Improved interface, improved management of custom statistic templates. Inventory Database Backup: Better handling of manual and automated backups. Loan Options: Circulation rules allow to set fixed due date. New Label Types: New label types are included in the package. Lost, Damaged, Not-Used Items: Improved handling of lost, damaged, not-used items. Improved handling of deleted records (inventory items, borrowers). Bins, Kits: management of bins and bin items is simplified. 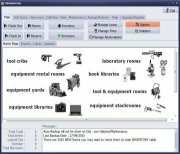 Check In-Out Athletic and Sport Equipment Manager: New ready to use athletic/sport equipment management template is ready for downloading. Old Loans: Improved handling of old circulation transactions. Check In/Out: Improved handling of keyboard TABs in Check In/Out window. New Custom Views: The Custom View function lets you customize the way you display, analyze, and process your data. There is a new option for the Item/Borrower Name Lookup drop down boxes in Check I/O window. New Simple Mode feature for Check In/Out module. Improved Label Printing: new label templates (durable). Custom Reports and Labels: Custom Reports and Labels are accessible from the library administrator window. Bug fixes: Export of COPY data fields to text file corrected; Wait Time calculation and display in Reservations corrected; special characters in footer/header did not save in the template - corrected; inch to cm change/scale in print preview corrected; error with limits in check in/out rules corrected. New Quick Sort: Define one-level or multiple-level sort for processing or viewing of you data. Quick sort commands are accessed from the grid's popup menu. Customize The Grid: Choose data fields and order of columns displayed on the grid. Improved Reports: Reports support multi-level sort, grouped reports support order within groups. Application Windows: Customize the size and position of the application windows. Improved Combo Boxes: Size of boxes and display order improve data field selection. This change lets you speed up advanced search definition, report layout definition, and search/replace definition in the equipment/tool main catalogue. Improved Inventory Search (add-on): Inventory stand alone Search sorts results by the "Search By" field. Bug fixes: VALUE data field in reports corrected; IDNO_1 data field in reports corrected; and more. Improved Replace feature; supports copy data fields. Improved Print Labels and Print Reports feature. Print Labels / Space - New Line option; bug fixed. Selection of data fields on the Main Grid; bug fixed. Default Reservation Period in Check In/Out; bug fixed. Handy E-T Manager, Cloud Version. How cloud version is working? Reports and Labels in the main window now display NEW REPORTS, NEW LABELS what allows the users to design new reports and labels directly from the main window. Replace feature in many database windows (main inventory, borrowers, new item, and new borrowers).